Hi Friends! Hope you are having a great Thursday. Wooo hooo! The weekend is almost here. We are hoping to get out and enjoy some of this gorgeous fall weather we are having here in Atlanta. Now, I know you are probably still munching on candy from Monday night, but I just had to share this delicious recipe with you. Are you ready for pecan pie mini muffins? Yep. You read that correctly. Pecan. Pie. Mini. Muffins. My Half-Mom (Oh, I guess I should explain. We don’t like term Step-Mother, Cinderella ruined it), Doris, made these for us while we were down at the Farm this past weekend. I can’t describe how good they made the house smell, and they tasted like a little piece of heaven in your mouth. As soon as I got home, I asked her to email me the recipe so that I could share it with y’all. Preheat oven to 350 degrees F (175 degrees C). Grease and flour 24 mini muffin cups or line with paper muffin liners. In a medium bowl, stir together brown sugar, flour and pecans. In a separate bowl beat the butter and eggs together until smooth, stir into the dry ingredients just until combined. Spoon the batter into the prepared muffin cups. Cups should be about 2/3 full. Bake at 350 degrees F (175 degrees C) for 20 to 25 minutes. Cool on wire racks when done. 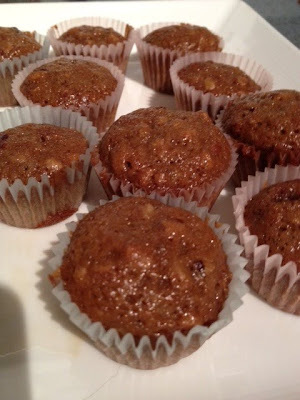 I made them on Monday night for Hubs and I to take some to work… and maybe for us to snack on at home too. They turned out just like Doris’. They were awesome. I really wish that I had some vanilla ice cream to go with them. That’s the only thing that could make them better. These will be great to take for any of the holiday festivities coming up. Can’t wait to hear what you think about them! Warning: They are in no way healthy for you. In fact, I need to go run right now – just for thinking about them again. BUT they are mini, so that makes you feel better about eating them, at least that’s what I am going to keep telling myself. Hope you have a great day. Talk soon, Friends! OH NO...now I am really starving! These look amazing...in a totally out of control kind of way! Yummers! 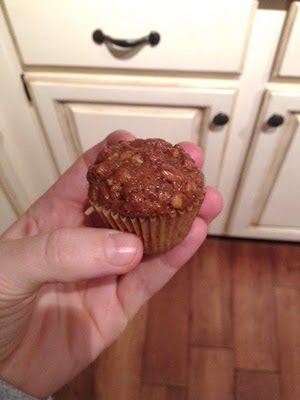 We don't have to eat healthy all the time...pecans are my favourite nuts these sound great! Looks divine! Cute little bundles of goodness.